Hey guys! I just heard about the tornado that hit the Georgia Dome and Centennial Olympic Park. A severe storm ripped away two panels in the side of the Georgia Dome during the Southeastern Conference tournament, sending debris tumbling from the ceiling, halting the Alabama-Mississippi State game and prompting fans to flee for the exits. My wife's parents called last night to say that they were ok. They were in downtown near the CNN center for a dental conference over the weekend. They spotted a table flying down the street and apparently the hotel next to them had some of the windows blown out and had to evacuate the building. A rare occurrence to have a tornado in a downtown setting for sure. One of my good friends is in Atlanta for the weekend, and he called and told me about the tornado touching down in downtown last night. I saw the damage it caused to the Georgia Dome on SportsCenter this morning; the teams that were playing at the time (Miss. State and Alabama) had to break for a little over an hour, and then the game resumed. I believe the games that were scheduled for today have been cancelled, as more bad weather is expected. I was going to roll down to Atlanta a little later this evening, but I think I may stay put this weekend. Yeah I was watching the SEC basketball game on tv when it happened. Sounds like they're moving the SEC Tournament to the Georgia Tech campus. As odd as this may read...I was there and I still can't believe it...a tornado in fact hit Atlanta...not just the Georgia Dome. In all my years I never thought I would be a part of such an event. My husband and I were downtown for an event. We had heard that storms were coming. A radio friend of my husband had texted him that the building he was in was swaying and that a tornado warning had been issued. They were evacuating Centennial Tower....the building with the ligthed chevron at the top. That was right near where we were so we decided that it was best to leave. The rain was pouring and you could hear hell beating above. I'm a southern girl so storms like this are not unusually but rare in March...in Atlanta anyway. Then the rain stopped and we decided to head for our car. When we got outside, it was as if a tornado had hit. Little did we know that one had actually hit. We strolled (if thats what you want to call it) down pass the CNN Center. There was glass everywhere. Cars were damaged. At first I thought it was a strong wing until my husband said, "[his nickname for me] look at the Westin." To see curtains flying outside of a 70 story hotel was quite unnerving. Then all of the sirens. Then we started to see people walking around dumbfounded. There were tens of thousands of visitors downtown at the time. There were so many events going on. The police were telling us to be careful of wires that could be downed and to watch for any windows that could fall free of their perches. I am so sorry to any visitor who had to go through this event. Atlanta is usually so very pleasant in March. I am so very thankful that there have been no reported deaths. My heart goes out to the homeowners who lost their homes. The arenas will be okay. It's the actually citizens who I am most sadden about. I am sadden that such a wonderful thriving place had to become the scene of some surreal horror movie. Who would have ever thought that a tornado would hit in a downtown area of a major American city? To see the Westin, 191 Peachtree and the Omni Hotel with windows blown out....to see the CNN Center battered and to hear that the Georgia World Congress Center was turned into a cascade of water...to see the Centennial Olympic Park with its torches blown over...to see the stunned faces of the visitors to your city as the watch the arena they are in sway side to side, not knowing if the roof would give way...it's all so very saddening. I hope to never see this again in my lifetime. Yeah you just don't see something like that happen in such a built up urban area hardly at all. Luckily despite all the damage there still hasn't been any reported deaths and even the reports of injuries don't seem to be too serious. My family moved to the Raleigh area from DC in the late 80s, I was in the 6th grade. A freakishly rare tornado tore through parts of suburban North Raleigh one night, cutting a path in the trees at Umstead State Park, destroying a strip mall, some apartments, and some homes. I remember surveying the damage as a kid, and you could visualize the path the tornado took. It is indeed a scary thing and something I never want to be caught in. Hi. Rhode Island UPer, here. Just wanted to say that I hope you were not affected by the tornado and that you and your families are safe. I was supposed to be at the dental convention at the GWCC this weekend and had 3 rooms booked for my staff and me at the Omni. About 3 weeks ago a few things (no bad) happened and I decided to bag it this year. Wow! The photos of the Omni are unreal. On the west face, there is that large glass wall that allows sunlight into the atrium. Nearly every glass panel blew out and the atrium is totally open air now. The photo of water cascading down the GWCC steps is incredible, too. There must have been an incredible about of rain that hit. Elsewhere I saw a photo of the Peachtree Plaza with several windows out, too. I cannot believe how close I was to being right in the heart of all of that. Yeah, I can tell by most you longtime Georgians that most of you guys haven't really experience what us in Alabama have on annual basis. The fact that a lot of the people in Georgia Dome and Phillips Arena was still in those buildings rather out in the streets or vehicles was a blessing. Considering this was an EF-2, and nobody was killed is a miracle. Now Cabbagetown, East Atlanta, and Virginia Highlands was hit hard, so I really feel it for those residents whose homes, apartments, and lofts were destroyed by this storm. It is a shame that today a lot of the northern suburbs have been pelted by the storms and possible tornadoes, and I have been informed that it are 2 fatalities in Polk and Floyd Counties. I was surprised to see how shocked many of you guys were because the Deep South is always dealing with severe weather, but then a meterologist friend of mine informed me that Atlanta and North Georgia only deals with about 1/2 the severe weather that Birmingham and Central Alabama sees annually. It really was miraculous that you had thousands of people (there was also a Hawks basketball game in progress) at what apparently was where the tornado initially touched down with only minor injuries. And it was a pretty busy weekend in the city. The Atlanta Home Show, the Dental convention, the St Patricks Day parade all had to be canceled with the SEC tourney moved to GA Tech. Amazing! Btw the GWCC is estimating their damage to be around $100 million alone. The AJC has a nice slideshow of aerial pics. Reminds me of the scene in The Day After Tomorrow where the tornados touched down in downtown Los Angeles. It really was miraculous that you had thousands of people (there was also a Hawks basketball game in progress) at what apparently was where the tornado initially touched down. I agree it really is a miracle that there were no deaths or serious injuries considering where that tornado it. We here in Statesboro seem to be getting some what you guys had earlier today. I got a warning on my phone from the university's alert system that we could expect to see severe weather and perhaps even tornadoes (unlikely, but still a possiblity) from the clouds we were getting. My heart goes out to those who were injured or lost a house, loft, etc. as well as the families of those who died. On a side note, I caught some of the SEC tournament on the TV today. It seems a little ironic that the SEC tournament would be played at an ACC school, especially since Georgia is Tech biggest rival. Stay safe everyone. You'll be in my thoughts and prayers. This is very sad to hear! I hope all of our Atlanta forumers are safe and didn't catch the worse of this! It is so unreal to see the damage that has been done. I would have never expected this. Quite amazing and fortunate that no deaths have been reported. From looking at those pictures from the AJC, it is hard to believe that no one was killed. The Omni hotel staff must have done a good job evacuating customers, because from the looks of that building, every window was blown out. It is scary, but it is a reality of living in the southeast. At least it was just property damage. I'm still amazed at no loss of life. The power of nature can't be underestimated. Atlanta was fortunate. Up here in Dalton, Friday night was mostly rain, Saturday was tense, it was electrical, news of the tornado was abuzz, and the temperatures were warm. I looked and saw the clouds swirling, converging and moving in several directions, the conditions were there and thankfully, we missed having one here. Atlanta's geography has played a role in it missing the severe weather that neighboring regions experience. The ridge and valley geography of Northwest Georgia and the upper Piedmont around Atlanta leaves little room for funnels to drop, especially since they travel southwest to northeast and the valleys run northwesterly. Atlanta is atop a rise, higher in elevation than most of the surrounding suburbs. Gainesville, to the northeast, has the unfortunate distinction of being the states tornado epicenter. Rare conditions created this tornado. Atlanta faired pretty well considering what we know can happen with these things. I wonder how may times a tornado has hit the heart of any large American city? What a crazy looking shot. Can't help but noticing the signature hook in the cloud on the right. So being an F2 tornado winds were anywhere between 111-130 mph! Other tornadoes that come to mind that to passed thru cities "downtown" I can think of was Nashville(late 90's?) and Salt Lake City(very rare)in early 2000's?? They analyzed this on the Weather Channell and said that the tornado is on the left tearing up Cabbagetown in this photo. You can see some of the vortex but mostly debris just to the right of the B of A tower. 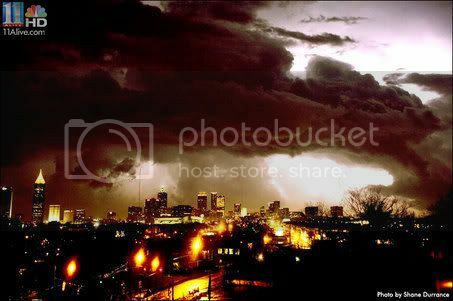 The guy that took it was trying get pictures of lightning and had no idea there was a tornado ripping through the city. A bit of sad news to report here. As Atlanta continued to clean up from crushing storms a week ago, a worker using a Bobcat to remove debris discovered the body of a man who apparently was killed when a tornado skipped through central Atlanta. "This will be the first fatality from the tornado," said Atlanta police Officer James Polite. Not only was the Georgia Dome damaged, but several other downtown skyscrapers and the Centennial Olympic Park were damaged in the tornado. Are there any proposals to repair that damage?